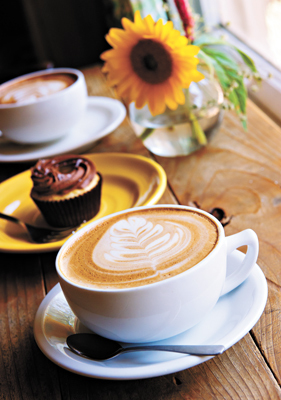 A coffee shop is more than just a place to get hot java. Its a meeting place and a studying spot. Its where people find laughter and heated debates. At Cuppies & Joe, drinkers become diners when they see the selection of perfectly baked and decorated cupcakes with names like Horse Bite and Mary Poppins. It also could have been voted best place to find an OCU student that isnt OCU, because this shop packs them in day and night. Oh, you want wine? Well Put A Cork In It! Its not rude; thats the name of the winery. Put A Cork In It Winery is an Oklahoma City establishment that makes a variety of meritage wines  blends that combine different varietals to create a more balanced flavor. With names like Dustbowl, Thunderhead and Redbud, you will savor the Oklahoma love in every glass. The competition for local beer dollars is constantly on the rise. It seems like theres always a new brewery coming online. But this years winner is an original. 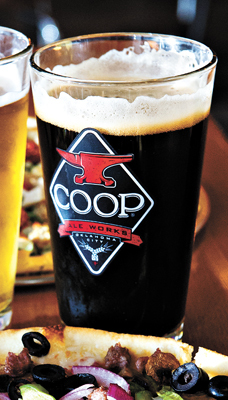 COOP Ale Works has only been around for seven years, but it has become the de facto local beer for many in Oklahoma City. Whether its hoppy F5 IPA; boozy, delicious Belgian-style DNR; or another bestseller, COOP makes beer Gazette readers love to drink. What the ale? Craft beer bars have popped up all over the city, but one of the first is still the best for Gazette readers. TapWerks Ale House is a Bricktown institution and one of the best spots in the metro to taste a wide variety of beers. Keep an eye on those taps because they constantly change. The waitstaff knows the beer selection forward and back, too, so whatever you crave, you can find it at TapWerks. If breakfast is the most important meal of the day, then its time Mayor Mick Cornett handed the key to the city to Jimmys Egg, which took the Best Breakfast category again this year. Theres a reason this Oklahoma City original has captured the hearts and bellies of diners across the state (and into a few others). Whether you come in for a stack of pancakes, a gourmet waffle or just a simple plate of bacon, eggs and toast and a cup or two of hot, fresh coffee, Jimmys delivers every time. Make your reservations now. Actually, make them a few weeks ago because Cheevers Cafe isnt the kind of brunch spot one rolls into unannounced. This upscale restaurant fills to capacity for lunch and dinner, but its weekend brunches are truly crazy. With a menu including French toast bread pudding, fried chicken and waffles and the always-popular Cheevers chicken-fried steak, the venue has earned its brunch stripes. Lunch has always been bitter about the way people fawn over breakfast. Its truly the middle child of the Daily Meal family. But that was before lunch found Empire Slice House, which Oklahoma Gazette readers agree is the best lunch spot in Oklahoma City. 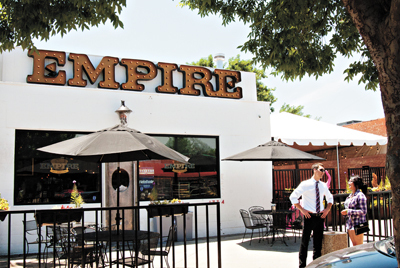 A great place for a couple pieces of pizza in a hurry or a long, luxurious lunch with a fine selection of beers, Empire captured a place in our hearts by making itself at home in our stomachs. When Beverlys Pancake House says it serves breakfast all day, it means all day. There are locks on the doors, but good luck finding this 24/7/365 diner closed even for a minute. 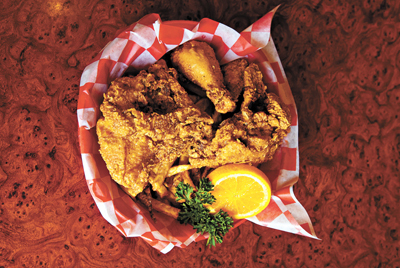 Whether its 3 p.m. or 3 a.m., theres always a friendly face inside Beverlys, waiting to take orders for pigs in a blanket, ham steak and eggs or the famous Chicken in the Rough fried chicken. The location has changed over time, but Beverlys is always a winner. Throw a rock in Oklahoma City and itll probably hit a contender for the citys best hamburgers. This years winner is no surprise  The Garage Burgers & Beer is opening new locations to meet the demand for the restaurants menu of specialty burgers and fries. Those who havent been should fire up their engines and pull into The Garage for a Huevos Rancheros burger and a big ol basket of Thunder Fries. Visitors to Oklahoma City who skip a visit to The Mule will kick themselves for missing out on this gourmet grilled cheesery. Dont be fooled by the laid-back feel of this restaurant and bar  as fun and free as it is in the dining room, the kitchen staff are pros at making delectable sandwiches. Take a bite of Macaroni Pony and customers will find themselves melting like cheese for The Mules tasty treats. It may have lost an R when it recently updated its name, but Iron Star Urban Barbeque kept the most important thing: high-end smoked meats. Party planners should check out the full racks of ribs and family-size sides of decadent macaroni and cheese. And those looking for a lighter option need Iron Stars salmon salad in their lives. As winter comes, be sure to remember the best warm-up deal in town is Iron Stars $6 bowl of Range Chili. King James editorial team did a real number on The Bible. Not only did they cut an additional eight disciples and delete the part where Noahs ark fights pirates, but they put apples in the Garden of Eden instead of the only food tempting enough to get Adam and Eve kicked out: pizza! Even so, anyone interested in experiencing the pleasures of pizza need look no farther than Best Pizza winner Hideaway Pizza. It makes pies so good, it ought to be a sin. Want to meet the meat? 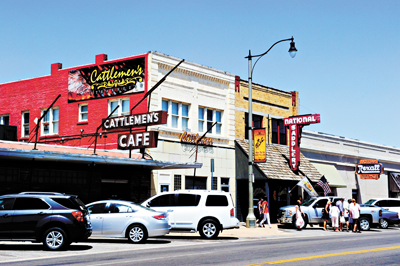 Head down to Stockyard City, where ranchers bring cattle to market. Then make a more personal connection with a stop at readers choice for best steakhouse: Cattlemens. This venerable beef base has been serving metro diners the finest steaks since 1910. There are steaks for every budget, including some fancy dry-aged prime beef for connoisseurs. Its been open this long for a reason, folks. Meow! Literally translated as sushi cat, Sushi Neko once again tops the polls for Oklahoma Citys best sushi. Its a posh spot to gobble the freshest fish in the city. The service is purr-fect and the menu gives sushi fanatics pause as they peruse the entrees, both cooked and raw. Just be sure to reserve your seats, because Sushi Neko is popular with all the cool cats in OKC. Goldilocks and the three bears put on a lot of porridge weight over the years, so its no surprise they started looking for a healthier option. Hotgreens was too hot. Coldgreens was too cold. But Coolgreens? As Gazette readers will tell you, its just right. Salad, soups, sandwiches and flatbreads are on-point and the results are easy to see on-scale. 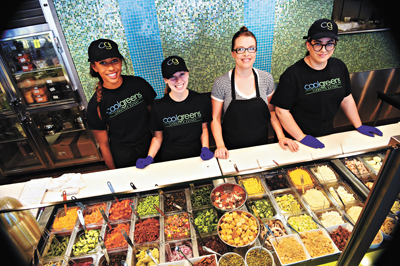 No matter your diet, this fast-casual eatery has something for you. The menu is always changing at The Bleu Garten because there are always new trucks parked inside, serving up the best in mobile meals to hungry diners. Even during the hottest swaths of the summer, crowds grow inside the Garten. Voted the citys best patio dining venue, its a fine spot for parties big and small. And those who get tired of talking will have plenty of fun with giant Jenga sets and a people-watching. 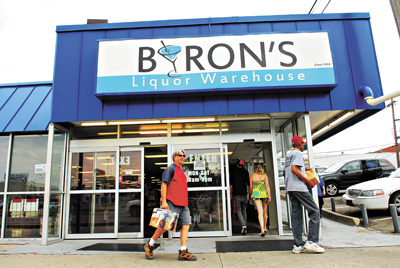 If Lord Byron were still with us, no doubt he would gladly write an Ode to Byrons Liquor Warehouse. The Best Liquor Store winner inspires loyalty as well as verse with great prices on a ridiculous variety of liquors, beers and wines. The parking lot always seems full. Anyone who is thinking about drinking is probably planning a trip to Byrons in the near future. Even though Whiskey Cake Kitchen & Bar isnt locally owned, it is still locally sourced with plenty of produce. Heck, the restaurant even grows herbs for dishes and drinks in its outdoor garden. The small chain is opening up new stores all over Texas, but Oklahoma City remains the only current Oklahoma location. Cocktail lovers can find an ever-evolving menu of drinks and plenty of great food to enjoy with them at Whiskey Cake. Like its namesake, Sir Francis Drake, The Drake Seafood and Oysterette attacked Oklahoma Citys appetite for fresh seafood like a pirate ship. Buckles were swashed and oysters were shucked as the restaurant that tells customers to Stay Gold took the citys local fish game to the next level. One of The Drakes signature features is an always-rotating lineup of fresh oysters, giving diners a chance to taste the world right here in OKC. Once again, readers voted this Plaza District favorite as their top spot for desserts. 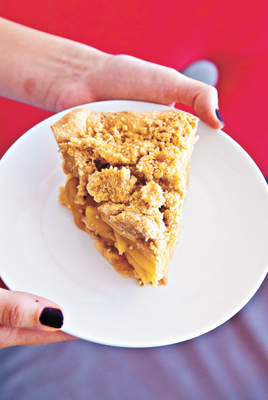 Just like nearby Empire Slice House, Pie Junkie offers fans a chance to enjoy a slice or take home an entire pie. The selection is impossible to beat, with creamy chocolates, luscious fruits and even some savory quiches thrown in for good measure. Those who love food on a crust will find Pie Junkie a must. Hola, amigos! Its time to give the Best Mexican Restaurant honors to Teds Café Escondido again. 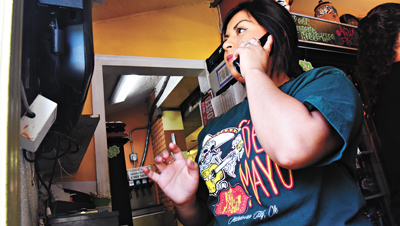 This popular local restaurant does fajitas, enchiladas and tacos so well, its almost loco. With a focus on Tex-Mex-style food, Teds kitchen loves to drape silky sour cream sauce and chunky chili sauce over meat- and veggie-packed tortillas. As difficult as it is to put down that last bite, youre almost legally required to save room for a sopapilla. If the Rio Olympic Games have inspired a craving for the cuisine of Brazil, the best Latin restaurant winner is the perfect spot to visit. Cafe do Brasil is home to a bevy of authentic Brazilian dishes and drinks. Some flavor combinations might seem unusual until you try them. 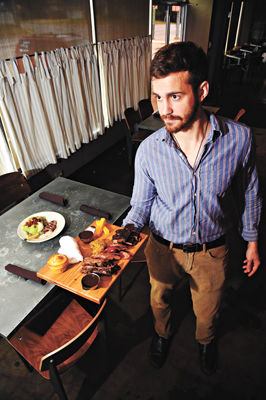 Trust owner Anna Davis to present dishes that are as beautiful as they are tasty. Start the meal with a caipirinha for a boozy kick from the Southern Hemisphere. Readers would have flipped their lids if last years returning champ didnt make a return appearance. Flips Wine Bar & Trattoria is an old-school Italian restaurant with one of the citys best patios. Sip a glass of Italian wine and look out as Western Avenue rumbles past. Slurp some whole wheat spaghetti marinara or order a crispy thin-crust pizza and enjoy the ambiance and camaraderie that has made Flips a favorite since 1985. Say Ingrids Kitchen and watch the ears perk up around you. Thats a group well-versed in one of the citys best spots for European breads, sausages and schnitzels. The ever-popular restaurant serves breakfast, lunch and dinner, but the weekends are when it really gets hopping, with The Silvertops jazz sets 2 p.m. every Saturday and a boisterous brunch buffet offered every Sunday. Zorbas serves so much more than gyros. Its unfortunate that Mediterranean cuisine is so often written off as gyros and kebabs, but thats only because other cuisines would kill to have a top two like that. And then, out of nowhere, comes falafel. Its like the 1992 Dream Team of delicious foods. So maybe youll keep getting a gyro at Zorbas, but theres nothing wrong with that. 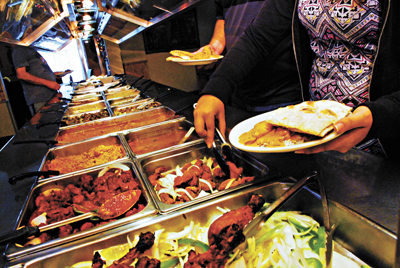 A shocking number of Oklahomans first experienced Indian food with Gopuram Taste of India. Some are introduced at Festival of the Arts. Others walk into the eatery to see a massive buffet of delights both sweet and spicy. The uninitiated need only visit once before theyre hooked on delicate jasmine rice, spicy chicken tikka masala and pliant, pillowy circles of naan. The air is filled with the scrape and sizzle of spatulas moving steak, shrimp and chicken across the blazing-hot teppanyaki table, but listen a little closer. Hear that crinkling sound? Those are the smiles of everyone at Musashis when they watch the chef prepare their dinner in front of them. Yes, the best Japanese restaurant winner is so good, it makes smiles audible. That sounds like a place everyone needs to try. If nobody has registered Garden.Wo, theyre missing out on a great opportunity. 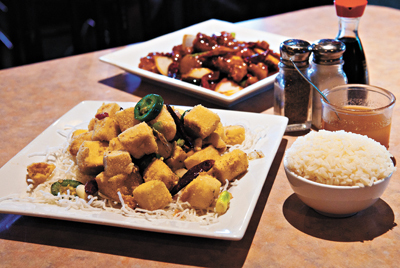 After all, Dot Wo Garden is one of Oklahoma Citys premiere Chinese restaurants, which might be why readers have once again crowned it best Chinese restaurant. Since 1989, Dot Wo has been Dot Wowing customers with a menu of American classics like beef with broccoli and true Chinese favorites, including clay hot pots. Thai-red of the same old food? Then its time to make your way to Thai House Restaurant, even though the name is misleading. Yes, it serves great Thai food. Yes, its a well-run restaurant with happy servers and a fully-stocked lunch buffet. But if its a house, would anyone look askance at someone who shows up wearing pajamas and fuzzy slippers? Thai House Restaurant is a tasty place to be. Which came first: Lido or Oklahoma City? Sure, the elites up in their ivory towers will say that Oklahoma City was founded in 1889 and Lido didnt appear to be here during the Land Runs. 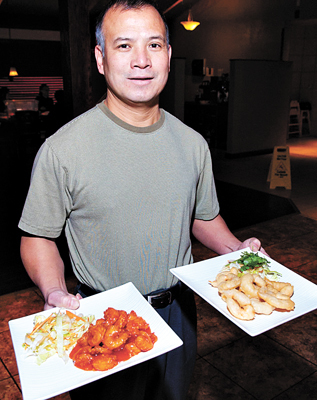 Whenever it got here, theres a reason this Asian District mainstay has long been a resident of Best of OKC lists. 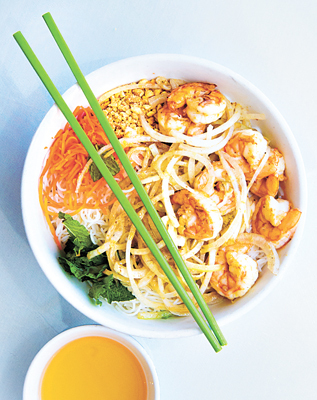 Theres traditional Vietnamese food alongside Chinese favorites and even a small menu of French cuisine if youre so inclined. Eating a punch bowl-sized serving of pho from Pho Lien Hoa is basically mandatory for anyone new to Oklahoma City. Volunteer community patrols are stationed at every intersection on the outskirts of town, stopping motorists and asking if theyve been to Pho Lien Hoa. 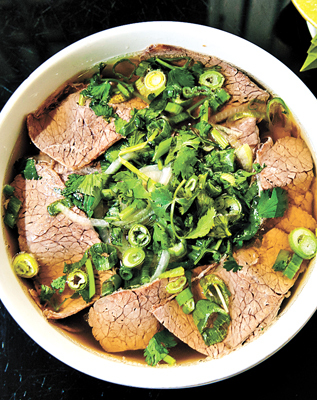 Though its the perfect dish for fall and winter, its not hard to find people craving a piping-hot bowl of beef and noodle soup in the middle of the steamiest summers. Its just that good. 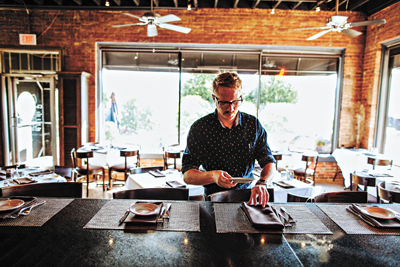 A Good Egg Dining Group did plenty of research before opening The Drake Seafood and Oysterette in Oklahoma City last year. The long-awaited restaurant paid off dividends quickly as diners went wild for its assortment of seafood options, oysters and the impossible-to-resist squid ink black mac. The brightly lit sign beckons customers at night, and its wonderful service and immaculately cooked menu keeps them coming back. Cheevers Cafe is a beloved institution of finer dining in Oklahoma City, and its menu is affordable. What readers voted for was an enduring quality that started with Keith and Heather Paul back in 2000. Cheevers is the rare restaurant that serves as a both a special occasion spot and a place to enjoy a great weeknight dinner with friends. Its more proof that dining doesnt have to break the bank to be fine. Theres plenty of parking behind The Pump Bar, and even though its a destination spot for many, its also common to see crowds rolling in from nearby neighborhoods. Located at the top of the Uptown 23rd District, this come-as-you-are bar serves strong drinks and tasty meals with a smile. Its not a place people go just to be seen, but its almost impossible not to run into someone friendly when you pull up a chair on the patio. Its almost impossible to have anything but a great night at Ednas. There are too many people happily hoisting the famous Lunch Box, singing along to the jukebox and milling about the room, meeting new friends to stay upset for too long. 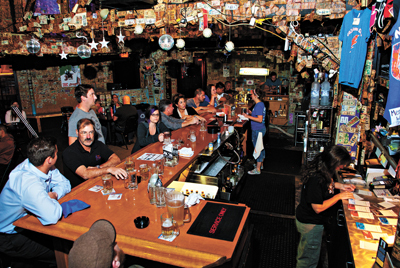 Edna isnt dancing on the bartop anymore, but her spirit lives on in a tavern that takes it easy and makes every customer feel like a regular, which is a pretty darn effective way to make more regulars. The best place to be when your team wins (or loses) is Republic Gastropub. Either you can celebrate with an expertly crafted cocktail or drown your sorrows in a beer from the restaurants massive selection. Even if you dont like sports, Republic is a great spot to find food that puts most bars to shame and enough people that theres always somebody new to meet. 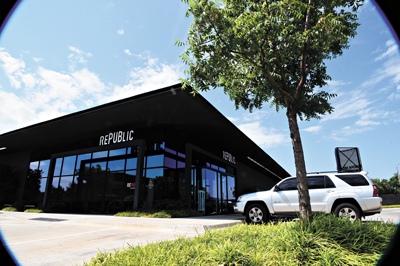 Just get there early  a whole lot of people love Republic. Sometimes, the only way to salvage a rough day is with an adult beverage. 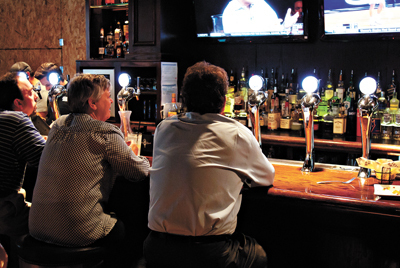 How fortuitous, then, that The Pump Bar is an adults-only establishment with a wide variety of drinks. You might consider checking to see if Uber is available or theres a designated driver nearby before diving mouth-first into the bars plethora of Tiki drinks. Ians Zombie wont reanimate your corpse, necessarily, but it might have you chowing down on some Okie Poutine like it was a bowl of braaaaaaains. It took no time at all for Guyutes upstairs patio to become a must-visit hotspot for local alcohol enthusiasts. There is a great view of bustling 23rd Street, the soundtrack is ridiculously, almost suspiciously great and the drinks are tasty and affordable. Strapped for cash? Theres a quality $2 beer on the menu. Feeling extravagant? A Sweet Pete is $9 but tastes like a million bucks. 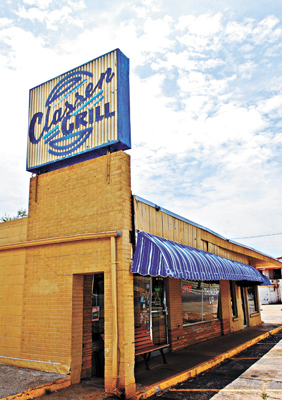 If everybody in the club enjoyed themselves last night, its a fair bet theyll be standing in line for Classen Grill today. This perennial favorite does everything needed of a diner and more. Recovery tastes so much better when its made of pancakes, sausage patties and scrambled eggs. Be sure to order the biggest pitcher of the fresh-squeezed orange juice available, because it always goes too fast. Serving some of the best pizza in the metro all across the metro is The Saucee Sicilian, where Gannon Mendez and his Nonna, Priscilla Jones, toss pies in the oven and jokes at customers. The lines might get long, but dont stray too far  the blazing-hot cooker keeps these pies coming out at a rapid clip. Get there early if you can, because once the dough is gone, so is the truck. Havent found them yet? Keep an eye on Twitter. Despite fierce competition that seems to grow every year, Cheevers Cafe once again nabbed the citys best Uptown 23rd district restaurant honors from the hungry pack. It is saying something, though, that a street that is quickly becoming OKCs food mecca leads back to Cheevers every time. Maybe its the comfy atmosphere, the chicken-fried steak or the seafood enchiladas, but theres no doubt this one-time flower shop continues to bloom for diners. Its hard to argue with the thousands of Oklahoma Gazette readers who chose Empire Slice House as their No. 1 Plaza District restaurant. This always-busy pizza parlor makes slices from the traditional to the unimaginable and quickly serves up beer and cocktails to thirsty diners. And if you ever get bored  unlikely in a spot so popular  the walls are covered in comic books that deserve to be perused. 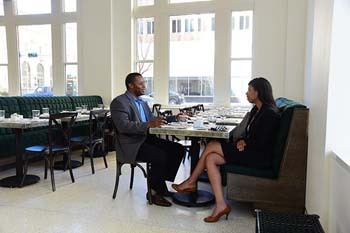 Whether its a business lunch or a nobodys business dinner, Paseo Grill is the king of Paseo Arts District. The cozy tables and dimmed lights are as intimate as can be. And those seeking a little privacy can request a table behind a curtain. The food remains, after all these years, steady and stellar. Like the Room of Requirement in Harry Potter, this funky little spot can be casual or special  whatever you need it to be. Its not a nice house. Its not a fancy house. Its Grand House Asian Bistro, where diners come from across the metro to partake in expertly cooked Chinese favorites and the grandest of traditions: dim sum brunch. 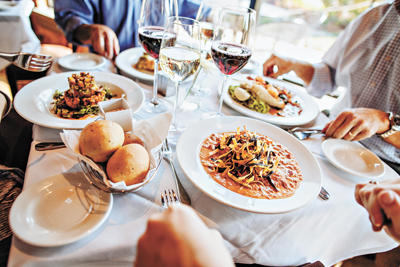 The expansive menu holds something for everyone. Though its known for Chinese food, theres even a sushi menu for those who cant get enough of that Japanese delicacy. And the service makes Grand House feel like Grand Home. Theres nothing hidden about Hideaway Pizza. Even as locations multiply across the city and suburbs, the Automobile Alley restaurant is still a destination, with its classic interior and glorious neon sign. Hideaway pulls in patrons searching for a pizza robust enough to handle the most toppings allowed by law. 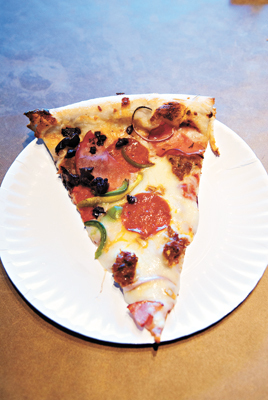 Get the Hideaway Special to experience a slice of everything that makes this pizza joint an enduring favorite. When Oklahoma comes to party, the destination is Bricktown. And for Gazette readers, Bricktown Brewery is the epicenter of the fun-quake. 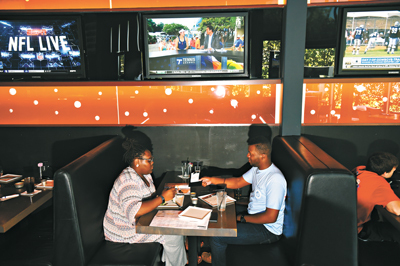 Home to locally brewed beer, big burgers and big flavors, this rapidly expanding concept busted out of Bricktown and made its way to Edmond, Shawnee and Wichita. But the original is still where visitors to OKC come to find a great meal before catching an Oklahoma City Dodgers game. The Curve emerged in the last few years as a dining hotspot. Even as a few places have come and gone (We miss you, Tamazul! ), one Classen Curve mainstay has gotten even better. Republic Gastropub remains one of the best restaurants in the area with a killer list of beers in the bottle and on-tap and a menu that gives new meaning to the idea of pub grub. Save room if you can, because Memes Donuts are the perfect cap to a night at Republic. If handmade eats with a gaggle of locals sounds like a fun night, wedge yourself into this crowded, cozy pizza place in Deep Deuce. Lunches pack in guests with an $8 personal pizza and salad combo, or you take the whole office and split a few gourmet pies. Vegan? Vegetarian? Gluten-free? Something they havent even discovered yet? Good news! The Wedge has a pizza for every palate and a great selection of beer to wash it down. The winner and still champion! 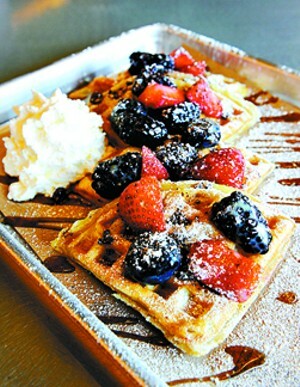 Waffle Champion earned this coveted prize again with an updated menu and updated hours. A heads-up to late risers: The breakfast lines are still kinda insane. Theres better news, though: The late-night waffle window means you can still be a champ before you end a night on the town. New selections like pizza grilled cheese and cheeseburger mac join old favorites, including the always-tempting buttermilk fried chicken in a waffle. The original location still draws big crowds at The Wedge. 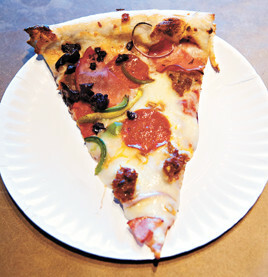 Oklahoma Citys original gourmet pizzeria was a hit as soon as it opened its kitchen, but at nearly 10 years old, it still grows its popularity by serving up the best flavors and adding plenty of new ones. One of the best secrets, though, is the antipasto platter. Tons of roasted vegetables, cheeses and a smattering of meats can make one of the best appetizers in town a must. With breakfast, lunch and dinner, Kitchen No. 324 has once again won the No. 1 prize for downtown restaurants. Breakfast is still the big draw, but dont sleep on dinner, when the chefs at Kitchen serve a short rib ragu that gets tongues wagging and desserts that might even have some skipping the meal. And for those who cant decide between breakfast or lunch, try some of both, as its brunch menu is served 7 a.m.-3 p.m. Saturday and Sunday. Theres something about those tacos and burritos that hypnotize readers into ringing up Big Truck Tacos for a pick-up order. As much as everyone loves the beef al carbon and the Crispycado, theres nothing like rolling the dice and unwrapping a mysterious 5th Amendment. It could be anything, but its always delicious. Big Truck Tacos also creates more than delicious tacos. Surprise! Try a burrito, cobb salad or a side of potatoes, guacamole or refried black beans with your to-go order.